Demeter, Greek goddess of the harvest, was an important and powerful figure in Greek mythology. She was the daughter of Cronos and Rhea, and one of the 12 Olympian gods and goddesses along with her siblings Zeus, Poseidon, Hera, and Hestia. The 12 Olympian gods were those that lived upon Mount Olympus and watched over much of the human race from there. As it is today, and probably will be forever, the growth of crops was essential to human survival, which meant Demeter - goddess of harvest, vegetation, fruitfulness, agriculture, and fertility - was of immense importance to human beings and was worshipped appropriately. Most famously, she had a major following just south of Athens at Eleusis, where a cult dedicated an annual celebration of the rites of autumn in her honor. In Demeter, Greek mythology had its caretaker and mother figure. This was a very important role that other goddesses sometimes played a part of, but none as fully as Demeter. Her grandmother, Gaia, was said to be the living Earth, though Demeter's name literally translates as "mother earth". This is probably because she was so actively involved in the growth and harvest of the food grown from the earth. Though vital, it was easy for some to take the harvest goddess's role for granted. It wasn't until she stopped doing her job that both the gods and humanity realized how important to human life Demeter really was. It was none other than Zeus himself that tested the will of Demeter by promising her their daughter, the Spring goddess Persephone, to the god of the Underworld, Hades. The main problem was that Zeus failed to consult Persephone's mother on the impending marriage, and when the impatient Hades rose from the Underworld and abducted Persephone from a flowery field, Demeter was distraught. Having no idea what had happened, Demeter, Greek goddess though she was, dropped everything and wandered the land, searching in vain for traces of her daughter. While searched and mourned, the crops failed and the land became barren. 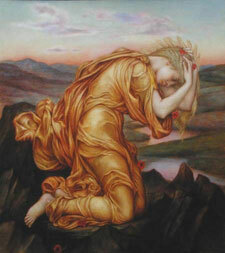 Humans prayed to the gods to return Persephone to her mother before the situation became dire. Zeus was in a bind. On one hand he had to appease Demeter somehow, but if he went back on his promise to Hades then the god of the Underworld would be furious, as he already felt slighted by having to live in the land of the dead while other gods enjoyed their seats on Mount Olympus. Not wanting to have to tell Demeter about his error in judgment, Zeus sent the messenger god Hermes to her to explain the situation. Hermes was known as something of a "trickster" and was more capable than most at resolving these kinds of situations with his quick thinking and silver tongue. He convinced the gods to agree that Persephone could return to the earth as long as she hadn't eaten anything in the Underworld. It was well known that Persephone had been on a hunger strike while in captivity, but it seems she had eaten from a single pomegranate. It was therefore determined that Persephone would be returned to her mother during the Spring season when the flowers were to bloom and new life was to be born. She would then return every winter to the Underworld to take on her duties as goddess of the Underworld and wife to Hades. Reluctantly, Demeter and Hades agreed to this compromise and thus the myth of the seasons was born. Demeter returned to her role as the harvest goddess and celebrated with her Elusian cult every Spring when her daughter returned. Demeter is sometimes considered the figure in the constellation Virgo, a reasonable explanation for the constellation, but one that I personally have some doubts about. Click here to return from Demeter, Greek Goddess of Harvest to the List of Greek Gods and Goddesses.